If you think flat Earthism is gone, you’re wrong. 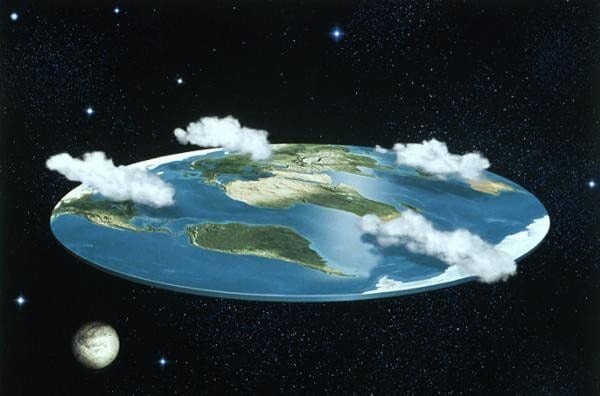 Some people still believe the earth is flat. The Flat Earth Society even has it own website. The society’s roots may be traced back to the 1800’s. However, the members don’t use scientific evidence to support their view. According to an interview with the society’s president in The Guardian three years ago, they believe the earth is flat because it appears flat. The sun and moon are spherical, but much smaller than mainstream science says, and they rotate around a plane of the Earth because they appear to do so. Most public health authorities still recommend that total fat consumption does not exceed 30 percent of total calories and that saturated fats be no greater than 10 percent. The British, National Institute of Clinical Excellence (NICE) stated in a document in 2010 that in order to better prevent coronary heart disease (CHD) at a population level, the reduction of dietary saturated fat is crucial. They estimated that halving the average intake of saturated fat (from 14 to 7 percent) might prevent 30.000 deaths annually in the UK. The public health recommendations are very surprising, considering the large amount of data indicating that reducing total fat consumption or the amount of saturated fats in our diet will not reduce mortality or affect the risk of dying from CHD. The largest controlled intervention trial on diet and heart disease to date, the Women’s Health Initiative randomly assigned more than 48 thousand women, 50 – 79 years old, to a low-fat intervention or a comparison group. Saturated fat intake was lower in the intervention group as was dietary polyunsaturated fat. However, dietary carbohydrates were higher in the intervention group. After six years of follow-up there were no differences between the groups in the incidence of coronary heart disease and stroke. So, replacing fat with carbohydrates does not seem beneficial. The much cited Siri Tarino meta-analysis, published 2010 in The American Journal of Clinical Nutrition included 16 prospective observational cohort studies. There was not a significant association between the intake of saturated fats and coronary artery disease. Ok, I know what you are thinking: “Now the Doc is going to claim the public authorities suffer from flat Earthism. Their recommendations are not based on current scientific evidence but rather reflect stubbornness and a tendency to stick with outdated, previously held views“. But believe me, these were not my words. Few weeks ago one of my readers drew my attention to a very interesting paper published in Food and Nutrition Sciences last spring, entitled Food for Thought: Have We Been Giving the Wrong Dietary Advice? The paper is written by Zoë Harcombe, Julian S. Baker and Bruce Davies from the University of the West of Scotland, Hamilton, and University of Glamorgan, Pontypridd, UK. The paper may actually bridge some of the gap between the public recommendations and what I believe is currently available scientific evidence. The authors went through 20 volumes of Ancel Key’s Seven Countries Study. It is well known the American and European public recommendations on diet and nutrition developed in the 1980’s were largely based on evidence from this study. This is the foundation for the Diet Heart Hypothesis which is still alive and well according to public health recommendations. Harcombe and coworkers highlight few classification errors in the Seven Countries Study which are quite scary in light of the huge influence of this study on dietary recommendations for the last forty years. Firstly, they point out that “the dietary references that were mentioned used unquantifiable descriptions such as “loaded with saturated fatty acids” and “cholesterol from butter cream meats and eggs””. Secondly, “the study classified cake and ice cream as saturated fats, as opposed to refined carbohydrates. Meat and eggs are described as saturated fat when their fat content is primarily unsaturated. Butter and cream are one third unsaturated fat, which was not noted in their analysis. So, here we have a profoundly influential research project introducing imprecise evaluations of macronutrients which have continued to present day”. The authors conclude that “The Seven Countries Study was not a scientifically robust study. The dietary references are vague, sporadic or absent. Many of the foods demonized by past research groups, even lard, contain more unsaturated than saturated fat. There appears to be a large gap between public recommendations on the relative consumption of different macronutrients and currently available scientific evidence. Although this somewhat strange inertia may be compared to flat Earthism, it’s causes are likely complicated and multifactorial. However, it appears that a part of the problem may be traced to macronutrient confusion and wrong definitions. In fact, it’s quite scary to learn that the Seven Countries Study classified processed foods, primarily carbohydrates, as saturated fats. Of course, this may have lead to wrong conclusions, some of which may have affected public health recommendations on diet and nutrition for the last three or four decades.